600hp at the touch of a button in your Diesel? Mr.John Wood is the second generation nitrous developer under the moniker of NITROUS EXPRESS, He hails from Texas "Everything is big in TEXAS"
I have faith in his product because they are scientifically computer controlled. As am one of the four original developers and promoter, I find some of the n2o manufactures are simple parts sellers. 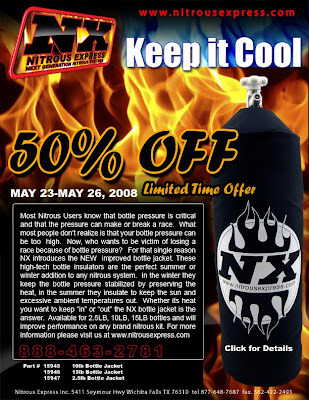 Learn more about nitrous and how it works in details you will under stand,call me. Big thanks for the system. 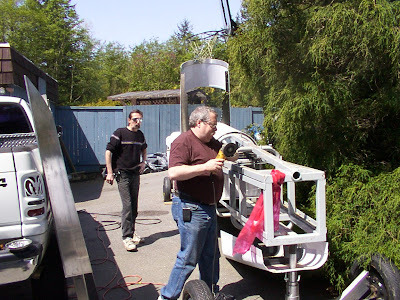 It is similar to the ones we built with many sophisticated upgrades. Will use two of them!! NITROUS EXPRESS 600 Diesel HP! Check out the new twins! 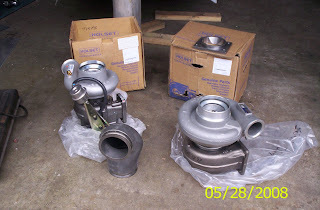 No matter how you look at it, Peak Diesel Performance has supplied the right parts for peak boost and horsepower. Safety first, KIRKEY Seat has it covered. The seat fits perfectly and it came with all the approved cover. Makes the crew grin! 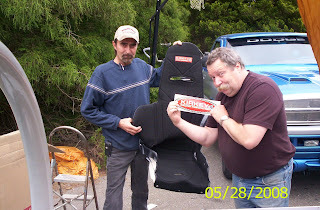 Sponsor of the day -KIRKEY RACING seats! 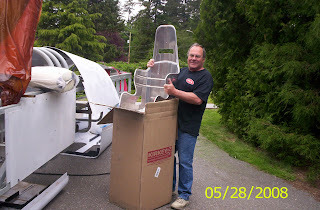 Thanks to Kirkey's man Kevin we received our super safe seat from the Canadian manufacturer of top quality racing seats. 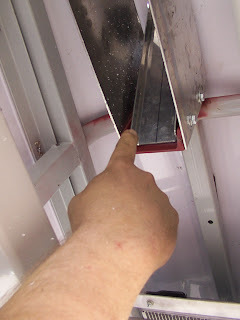 They are the choice of all the top builders in North America. 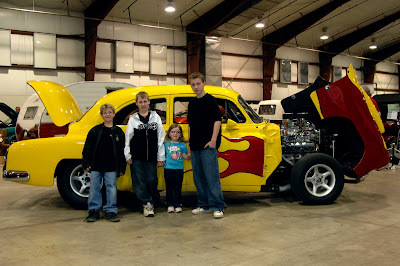 Check their website for all your hot rod and race car builds. 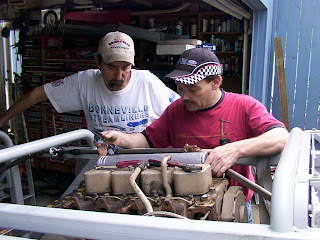 www.kirkeyracing.com Thanks Kevin for taking the time to check out our website. 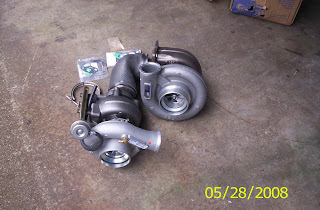 Harry Kelleher, owner of (check our link)Peak Diesel Performance sourced the best turbo combination the Holset 40 + 52 for Piers Harry. 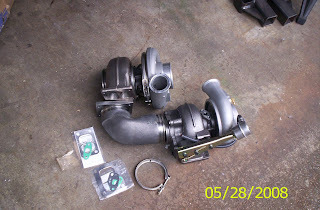 Piers and Harry worked with sponsor, Holset's engineer, Malcolm Clark at Cummins in Memphis Tenn. to spec the turbos for the twin set up on our Cummins 3.9Bt. Thanks to Louis McCaughan, regional manager for BASF, I was able to chose a gold color for the G'Hawk that will look good in sun or under artificial lites at the shows. They have thousands to pick from so it is easy to select one you like, in my case I was trying to remember 47 years ago. It will be a metallic gold and is "GREEN" because it is water borne, the way of the future and good for the world. Thank you BASF for helping us help the environment. 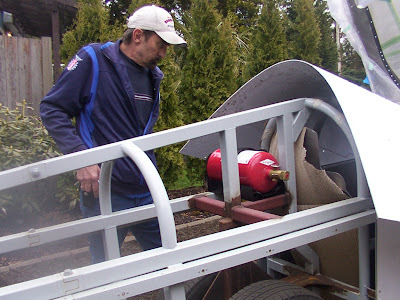 Able Auto body is a member of Collision Plus, #2-20120 92A St. in Langley's Walnut Grove was kindly donating their big bake oven to anneal the rear body parts to remove some of the tendency to spring flat when unfastened. 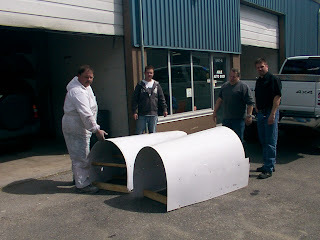 Pictured here is the head painter Dave, service manager Darragh, Kevin Knox and Doug Hannesson the owner. The plan is to place the parts in the oven overnight @160f while they are held in shape by wooden struts. What did you do on the May 24 weekend? 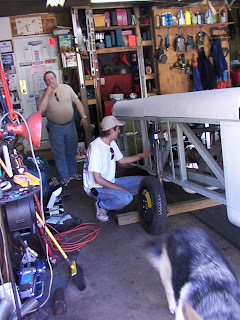 Werner and Kevin gave up their weekend family time to work on the final parts of the landing gear and to install the tail. 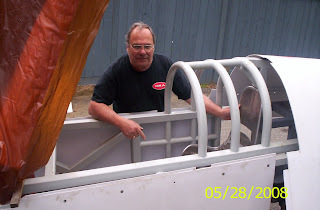 Paul Dukes from HYDRA STEER came to work on the steering shafts, and a good thing he did because we need to change some angles now that we have all the engine compartment equipment in place. This team is dedicated and driven. What fantastic people ! A tale of tails - F-86 that is! 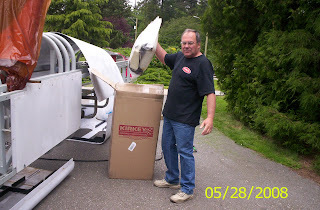 Werner and Kevin are the guys who get the job done! 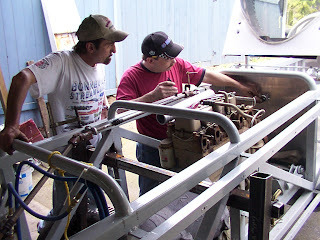 Here they are fitting the mounting system they fabricated to hold the F-86 tail secure at any speed. Check out the shirt! Click on the picture to enlarge. 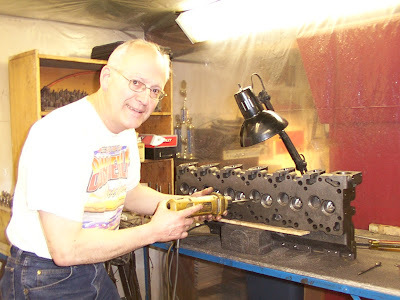 Engine Boss very happy with head. 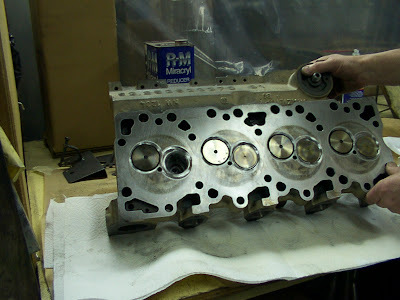 Piers Harry inspected the head upon its return from Zoltan's porting and polishing work. 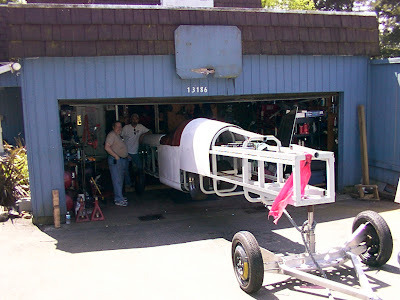 It was no surprise that the car 32 feet plus only goes half way into Werner's shop! 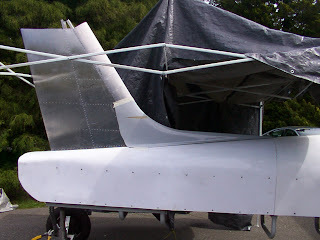 But the landing gear make it easy to move in and out . There is a little work to be done yet but it looks great. Thanks to Kevin Werner and Darryl Murphy. Next is the body shop to do the prep and paint. See you all at COLLISION PLUS! 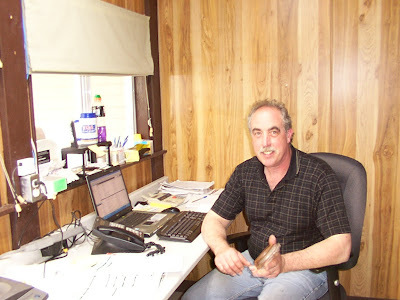 Harry Kelleher is our "main to go guy for performance and standard parts." Harry knows what we need and more importantly where to get it fast and at a reasonable price. 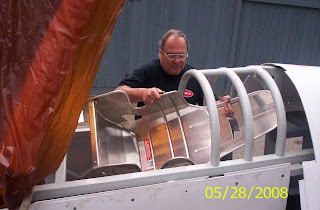 Kevin Knox (www.kevinknox.com )and Collision Plus Consultant, Frank Vaski discuss the preparation of the Murphy Aircraft Manufacture built tail. Barklee is not interested in cars if they are not giving him a ride. watches for the cat! Collision Plus a new sponsor. 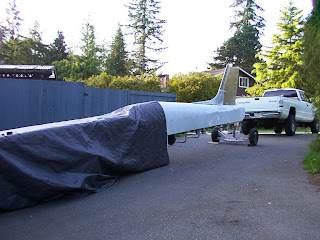 Watch the blog for more about Collision Plus as we start to do the body and paint. Culpit is caught in the act! 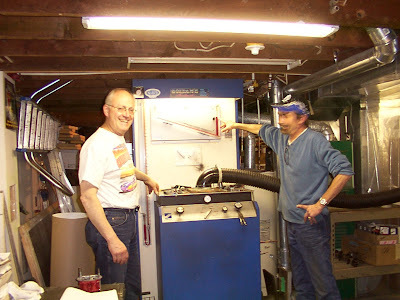 Werner has caught the tail plucker! It is no surprise it is Kevin. 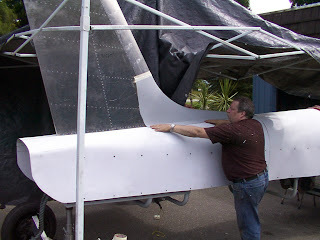 Busy replacing the tail with the F-86 scaled tail he designed and Darryl Murphy built. 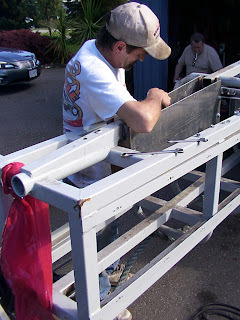 Here he is cutting the spine of the hawk to fit the vertical stabilizer brackets he also designed. Who plucked the tail feathers from the hawk?? Who would want to be cruel to a bird?? 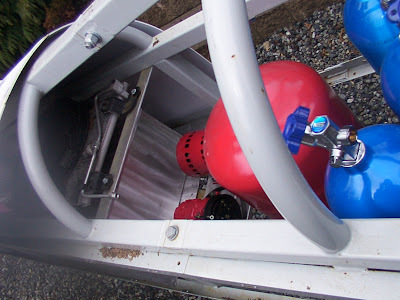 The large red tank is the accumulator for the air lift system built by "Sir Roland" at AGGRESSIVE TUBE BENDING. The sharp eyed folks will note that it is in fact a recycled propane bottle from my BBQ. 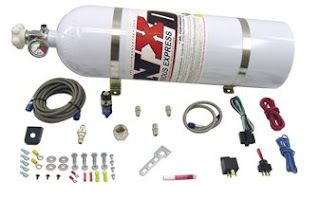 The Nitrous Express 600 HP diesel nitrous oxide system will replace the brand X bottles used only for mock up. The Red bottle upper right is the cockpit fire bottle supplied by Acme Fire And Safety Co. Ltd.
Acme Fire And Safety Co. Ltd. is our sponsor of choice for all our fire prevention/suppression needs. Maybe you don't have a racer that uses the exotic systems like we use but of all our homes and businesses need the protection and Mike Tonolli and his people are the best! They have been serving the people of the BC since 1972! 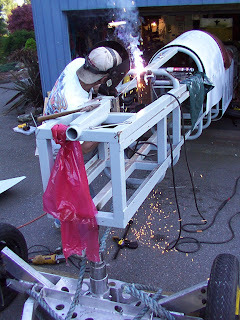 Werner is planning the mounting bracketry right behind the cockpit. The engine bay also gets a special fire bottle . 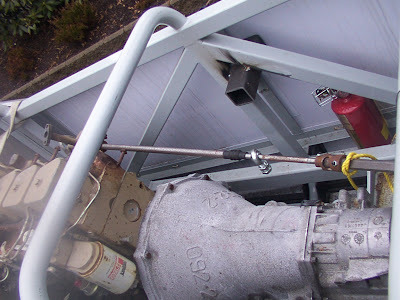 This too was supplied by Acme Fire And Safety Co. Ltd. Thanks for the support! I will feel better knowing fire is not going to be a problem in this car. 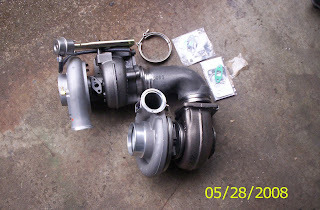 Zoltan's Porting Heads and Flowing Carbs! 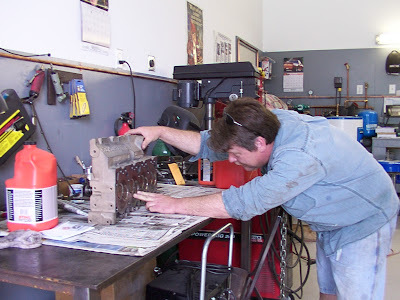 Genius at work on a 6BT Cummins head. 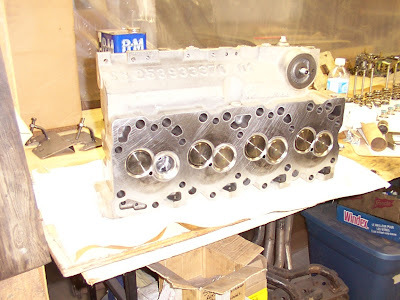 This is the Goldenhawk's 3.9litre 4BT. 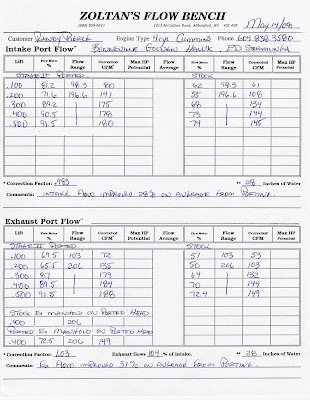 Here is a copy of the Flow sheets. They indicate an increase of approx 40CFM. that was ported by yours truly. it also killed about half the gain made by porting. I think we will try a different header! 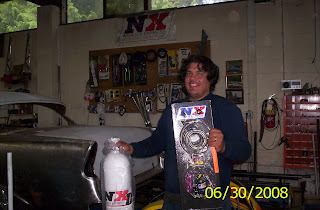 Nitrous EXpress chosen as best diesel nitrous system. Check out the web site and the great deals. More on these guys soon! 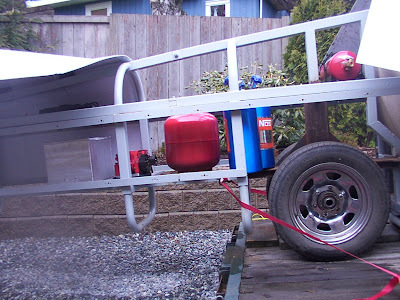 You can order from Chief Chassis in Langley. An email to BASF was answered by Louis McCaughan Regional manager for BASF, that lead to Darryl Tippe Sales manager for the paint distributor, White and Peters Ltd. and his leader by Mort. Now, Mort's not your average drag race fan but he has been following the Bonneville Salt Flats and Speedweek since he was a child. So what's this got to do with body work and paint? Well it seems that a large auto body group is has commenced the application of water borne and environmental friendly finishes! After a Performance Group of Collision PLUS convention at the RIVER ROCK Casino in Richmond,BC, we unveiled the car in all it white ABS replete with the accumulated dings and flaws of the primary crafting of the custom body for the attendees to witness. 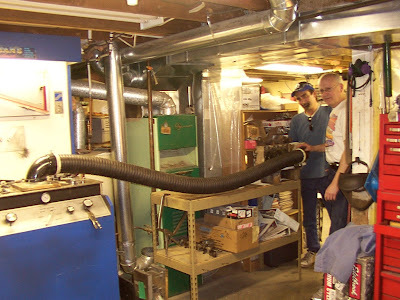 The comments from the group of owners and technicians were kind and the the common question was "How fast will it go? and "How straight do you want it panels." 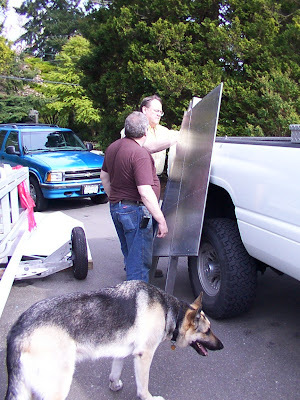 We explained that the panel will have some waves in them sitting still but will change shape has it complies with the pressures that surround it at 330 mph. 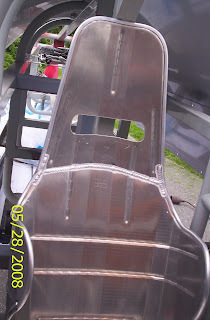 After some discussions, over the next week they have agreed to handle the body and paint. 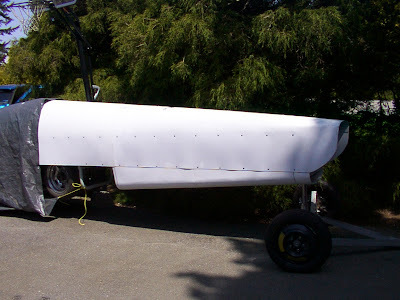 The logistics of the sponsorship have been left to the corporate COLLISION CONSULTANT. His name is Frank Vaski. 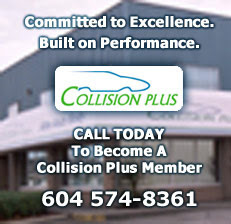 WELCOME COLLISION PLUS! Here's a pic of our 51 with our 3 boys and daughter. 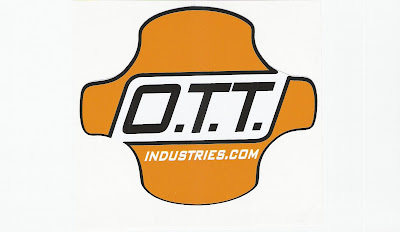 "They think your car is coool"
Trevor Jewkes of PAT'S DRIVELINE and Ben of OTT INDUSTRIES conferred and deduced that at 10,000+ rpm the drive shaft needed to be different from originally planned. 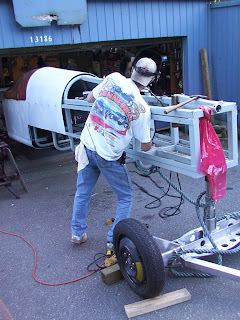 Therefore Trevor stopped by the shop and remeasured to make sure all the lengths were correct. Jay passed the extreme welders test! Stress of test is over! Exhaust headers PYTHON 4BTX fabricated! Engine in Craig Hoveys machine shop. Feb.-Mar.-Apr.Gone but we are not.